US agression and ‘Honorable existence’! United States-led NATO forces killed 15 tribesmen, including women and children, in it’s first-ever ground attack inside Pakistani territory on Wednesday. The US forces landed by 3 choppers inside Pakistani village of Musa Neeke in South Waziristan Agency (SWA). The soldiers started indiscriminate firing with their automatic assault rifles at the sleeping inmates and shot dead nine family members of Faujan Wazir, including four women, two children and three men. The troops also killed another villager, Faiz Mohammad Wazir, his wife and two of his other family members. Prime Minister of Pakistan and President has strongly condemned the unprovoked and cowardly act while the Senate, National Assembly and NWFP provincial assembly passed unanimous resolutions condemning the killing of innocent civilians and demanded the suspension of logistic support to US forces in Afghanistan. “We reserve the right of self-defence and retaliation to protect our citizens and soldiers against any aggression,” remarked Maj Murad, an ISPR officer based in Rawalpindi. Corruption and governance goes together in developing countries, especially the third world where democratic process is influenced by bloodline, money politics, feudalism, intervention of imperialist powers through military and religious exploitations. The process becomes more painful when the society is trying to develop from under develop, while profiled as ‘high risk investment zones’ these countries need investment for development, the clever investor who is aware of this fact bargains for softer terms and governments are unable to deny, the rules are relaxed and projects vital for survival of society are given to these investors, an example of this is can be the IPP’s in past Benazir Bhutto’s regime in Pakistan which was widely criticized at that time but proved to be a lifeline for Pakistan’s industry in following decade. It’s not a national interest which forces the governments to relax the rules, once relaxed in broader national interests, these rules become a tool for corruption and personal benefits, the prime examples are Pakistan’s defense agreements, where an Air Force Chief got kick backs of Billion of $ and many politicians like Asif Ali Zardari and Nawaz Sharif multiplied their holdings, Shaukat Azaiz sold the national institutions for personal gains and was forced to stop from handing over Pakistan Steel and a PIA owned hotel in New York by Supreme Court and Pakistan Senate respectively, the father in law of former dictator Pervez Musharraff got the contract of elevated Rail track in Karachi for five times higher bid from national exchequer then the Chinese company offered and that too on soft loan basis. The Great Game –The Count Down Begins ! In its December issues Global Research of Canada in a series of articles by Prof. Michel Chossudovsky outlined the American design for the break up of Pakistan. I give below the gist of his remarkably till now accurate analysis(with a few comments of my own),in the hopes that it serves as an eye opener for my country men- and my friends in India. The report states that due to the assassination of Benazir Bhutto the process of US sponsored “regime change”, which normally consists in the re-formation of a fresh proxy government under new leaders, has been defeated. Their trusted ally General Pervez Musharraf – having been exposed – cannot long remain in the seat of political power. More over the fake elections supported by the “west” scheduled for January 2008 would now only create a political impasse. The Peoples Resistance and numerous concerned members of the Civil Society in Karachi would like to invite YOU, the people of Pakistan to join them in a peaceful protest to appeal for the release Dr. Afia Siddiqui, who was kidnapped from Karachi in 2003 and has since been detained without charge in a US Military jail in Afghanistan. We appeal for speedy justice and her immediate return to Pakistan along with her three innocent children. Bring placards, flags, posters simply appealing for Justice for Dr. Afia Siddiqui and her children. Spread the word far and wide so that more people can participate in this noble and humanitarian effort. Siddiqui’s claim is contrary to the heavily contested position of the US administration that she was detained in July by Afghan forces while attempting to bomb the compound of the governor of Ghazni. 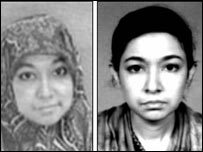 The US has previously denied the presence of female detainees in Bagram and that Aafia was ever held there, bar for medical treatment in July 2008. If you were for a moment, believe in all the BS that comes out of America then this must be probably yet another sparkling attempt to fool the world for the umpteenth time.